Designed for use with a Sure-Fit Harness to restrain your dog while you drive -- attach to the bottom ring of the harness and thread seat belt through the loop end. When used as a restraint, the Car Control Strap and Harness helps to prevent dangerous driver distractions and keeps pet safer during sudden stops. Just attach to the bottom ring of the harness and thread seat belt through the loop end. 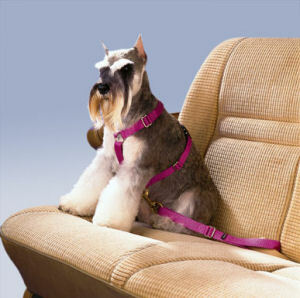 Please note that neither the Harness or Car Control Strap has been "crash tested" (nor is any other "safety seat-belt" restraint that we know of), but it will prevent your dog from joining you in the front seat at a sudden stop. Please Select...Small 3/8" x 11-13" Medium 3/4" x 13-16" Large 1" x 15-20"